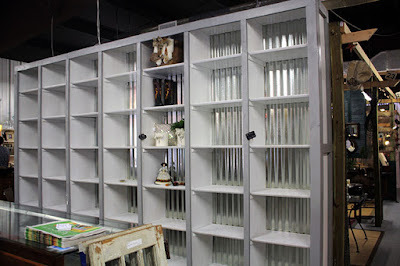 I've decided to do a regular post here that features a few of the items I have for sale at Southern Antiques and Accents. I'll likely do this monthly, but it could be more often depending on how much I switch up the display. Before I show off today's features, let me share some news. Yesterday when I went to add a few items, I was greeted with happy news. My display is moving into a new, more open spot. 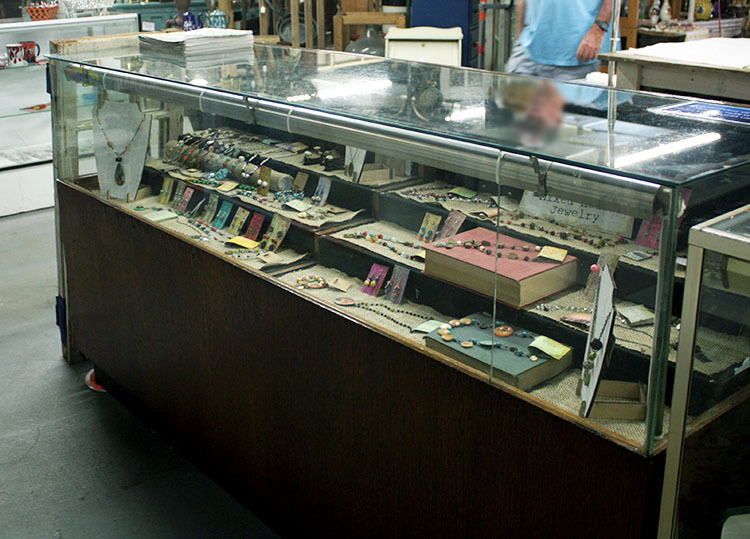 Currently, my jewelry is housed in a glass case that makes it hard for customers to really get a feel for my pieces. Later this week I'll be moving into the center column of these open shelves. The shelves will give customers a chance to pick up and examine my creations without having to wait for someone else to retrieve them. However, this also means that I have to figure out a new sign and display in just a few days. Yes, I'm freaking out a little. 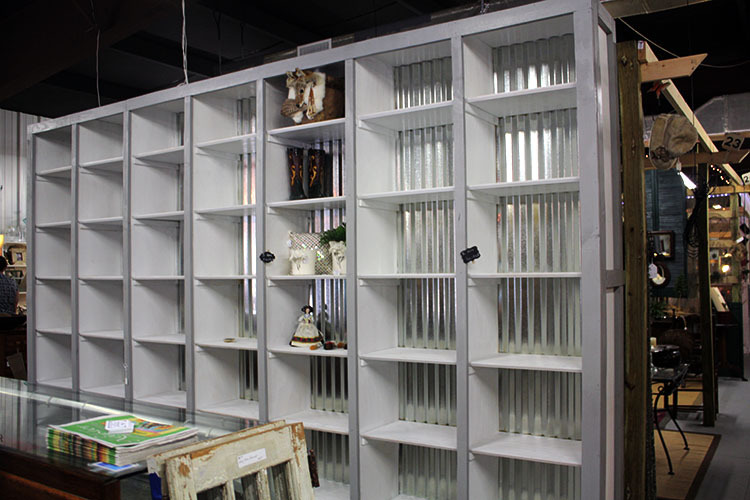 In any case, let me show you a few items that are currently available at Southern Antiques and Accents. First is this simple but stunning necklace. The focal was made from a Vintaj arte metal blank that I ran through the Vintaj BigKick I won a few months ago (I should talk about that here at some point huh?). I added some alcohol inks and Pearl-Ex powder before sealing the whole thing. It has amazing depth that you just can't see in pictures. You really should go check it out in person! Next is a more eclectic piece. The focal is a collage I made some time ago. I paired it with a beautiful handmade lampwork bead that was purchased AGES ago. 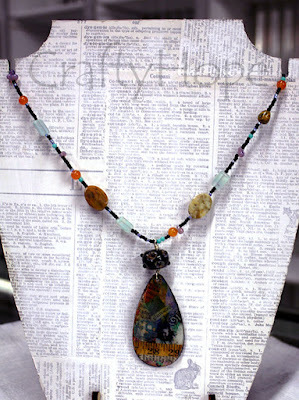 The chain of the necklace is a mix of glass and stone beads that pull colors from the collaged focal. Finally, there's this simple necklace made of art beads, a button, and chain. 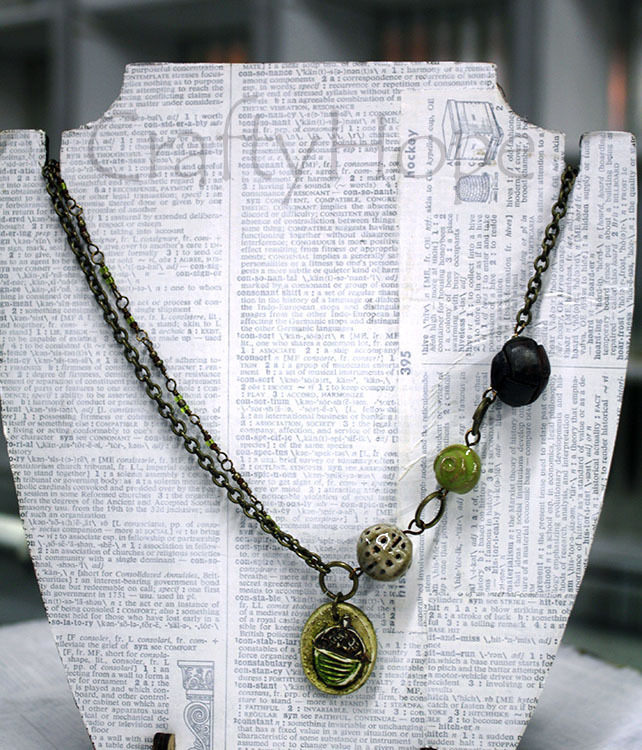 The focal is a Humblebeads polymer clay acorn charm. On the chain is a Gardanne beads (I think!) enamel bead and then a green Gaea ceramic bead. A leather shank button ends this line of elements before the metal chain. The other side of the pendant features antiqued brass chain and a chain of wire wrapped seed beads (hard to see in the picture). 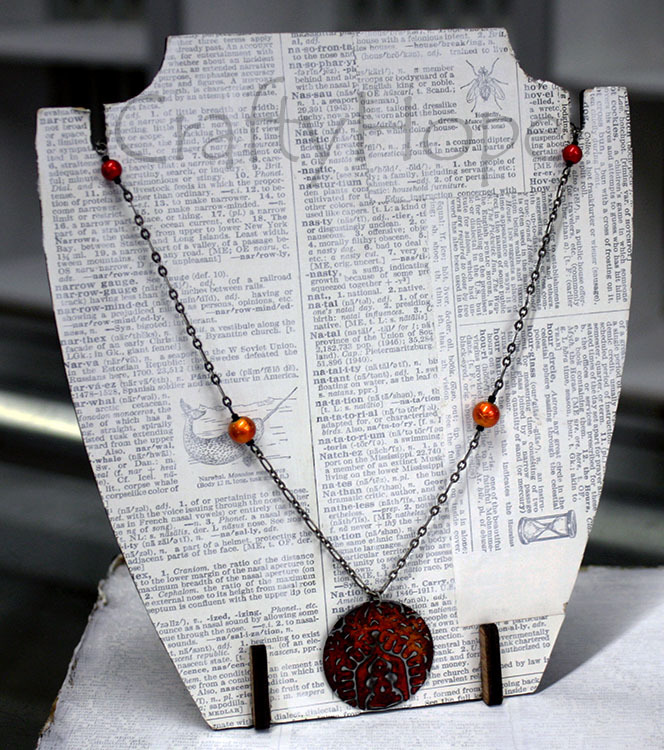 It's a lovely Fall necklace. There's tons more in the case at the moment. I'm not sure how all the pieces will work out in the new display, but rest assured that these three will be there the rest of the month unless they go home with someone else. Now, to come up with some creative, eye-catching displays for my six cubbies. If you've got some amazing ideas and suggestions, please let me know. I welcome your creative input. Wonderful news! and don't freak out, it'll all come together, it always does and it will all look fantastic! That's great news about the better space, Hope. It really does make a difference if people can pick up and feel the pieces without having to go ask for help. You'll get it all together, I'm sure. The featured pieces are all great! I especially love the collage one. Is that a crystal piece that you've put the collage on? Good luck with your pretty jewelry. Judy, I definitely hope it helps. And, we'll see tomorrow when I head back over there if I've pulled it together. I'm working on a small mirror now, but still have to figure out a larger sign. Eesh! The collage one is done on a simple piece of lightweight wood (balsa maybe), that's why the lampwork bead was added - for weight! I do like the idea of collaging on a crystal. Lord knows I have a TON of them!! Thanks for your well-wishes. I do appreciate it! Very exciting! and yay, letting people touch is the key to selling more, things behind glass make them feel like museum pieces and unavailable~ so excited for you! Jenna, I think so too! When they mentioned these open shelves a few months ago, I was ready to move. . .Ha! I do hope it brings some life to my pieces and motivation for me to make more. Thanks for sharing in my excitement! I think this is definitely a change for the better! People always love to touch things that "speak" to them. I know that I often pass over items in a display case for those I can touch and feel. I like to sense the energy of objects. Knowing you as I do, I am certain that you will come up with a fantastic new display! Wonderful news for you!